We made a couple of attempt at the narrows, but found only light shifty air there. The only boat of the entire fleet to get through was Bob McGowen with his new Cheapskate. 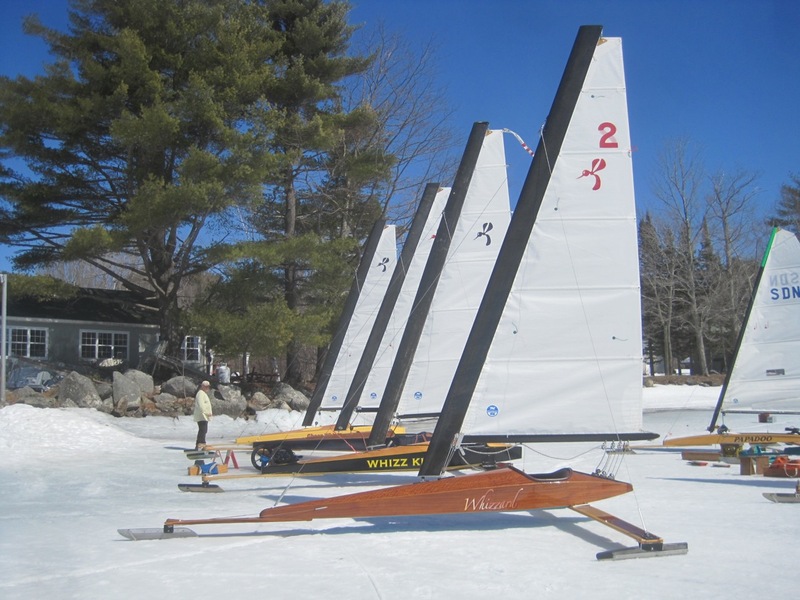 He was able to sail downwind soft-water style, but had to walk back upwind. Bravo for the attempt, Bob. 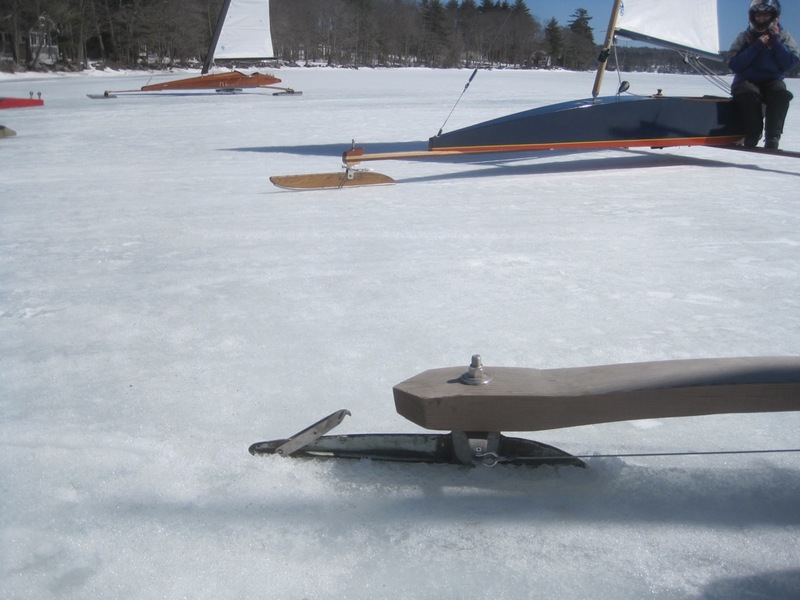 He says that he wished he discovered ice boating twenty years ago. The rest of the considerable fleet chased the wind and each other all over the broads for most of the day. The most dedicated switched to slush runners in the afternoon, although the areas of true ice evolving around the snow ice remained hard. There is still sixteen inches of hard ice, observed through a fresh ice fisherman’s hole. He told me “she ain’t gone punky yet”. You heard it here! Some elected not to switch to slushies, but were content to revel in the sociality of the day and bask in the high March sun. In this case not setting the brake is probably ok. In addition to all these boats, there were a couple of DN’s out sailing, and Bob’s Cheapskate (probably promenading through the narrows at about this point). Everyone is excited about the prospects for next weekend and some sort of Spring Fling. We can’t hope to top the famous feed put on by Leigh Turner at Winny, but we’ll give it our best shot. 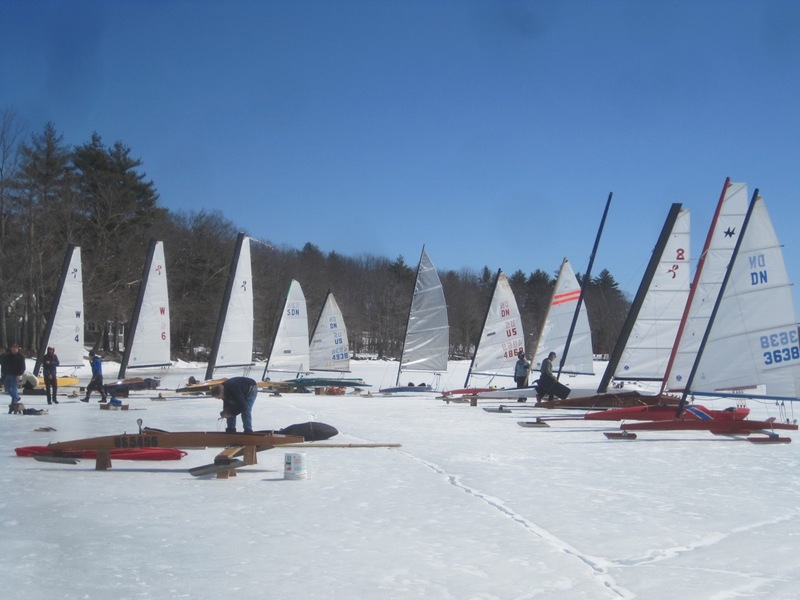 Watch the weather, chat with your iceboating buddies about the possibilities, and stand by here for up-dates. Thanks, as always, to the Lamptons for the fantastic access, and for opening up the “clubhouse”. Our enjoyment of this fabulous lake would be severely limited without their generosity. David even helps to lug gear up and down the ramp! Lastly, as an ardent advocate of the Whizz, we can’t help but sharing this one: Whizzard, Whizz Kid, Wizzdom and Cheeze Whizz. We missed Whizzkey and Whizzper, Gee Whizz and Oz, Whizz-Bang too. Maybe next time. Thanks for all the great sails, Henry!